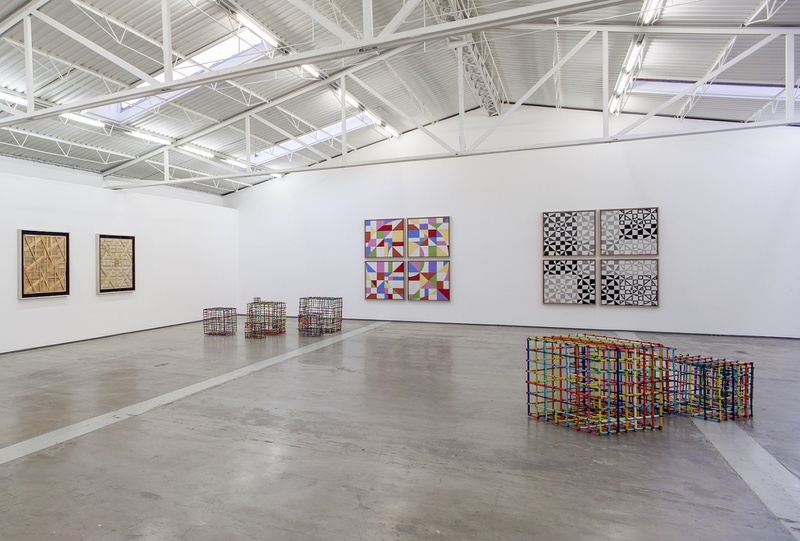 More than a small retrospective, this new exhibition by Eduardo Terrazas offers itself as a tentative to encompass the wide register of techniques and mediums that the artist has been exploring since the very beginning of his career. 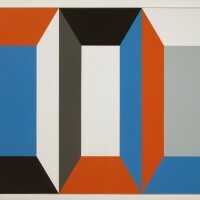 However, it can also be seen as an exposition that seeks to recapitulate the long trajectory of Terrazas as a visual tist, given that the earliest piece in the show dates back to 1970 —or, at least this is the year of the drawing, which gives the shape to a painting on view at the exhibit: a scheme of contrasting colors that welcomes the spectator at the end of the gallery’s staircase and that reminds us of the discussions that took place, at that time, over the interaction of line and color. 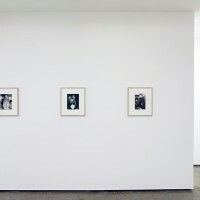 Also from the 1970s is the series of photographs displayed in the back room of the gallery. 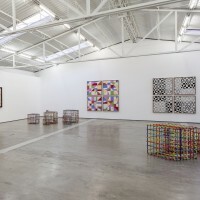 This means that, on top of the variety of processes and techniques, the show embraces more than forty years of plastic experimentation. Since the 1960s, Eduardo Terrazas has complemented his architectonic practice with a two-dimensional investigation —running parallel to the design and construction of buildings— which, without a doubt, feeds on his understanding of what it implies to work with volumes and physical structures and not only approach those matters with theoretical assumptions on paper. 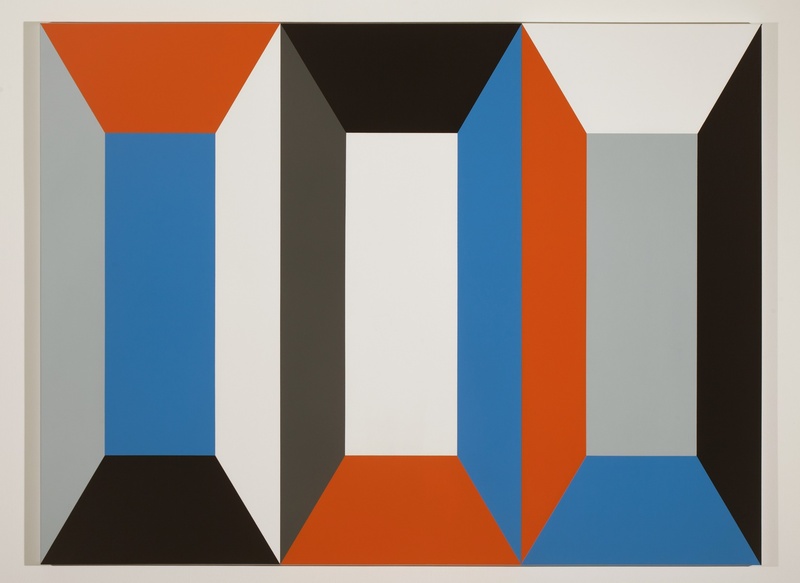 Hence much of his work as an artist —which, in fact, uses as starting point the pages of a notebook— has an openly constructivist air that, occasionally, can surpass the surface and extend into space. 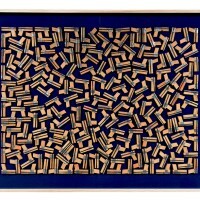 This is exemplified in an extensive mural, displayed in the gallery’s patio, assembling a series of wooden blocks, inked with aniline, like some board games such as Jenga. 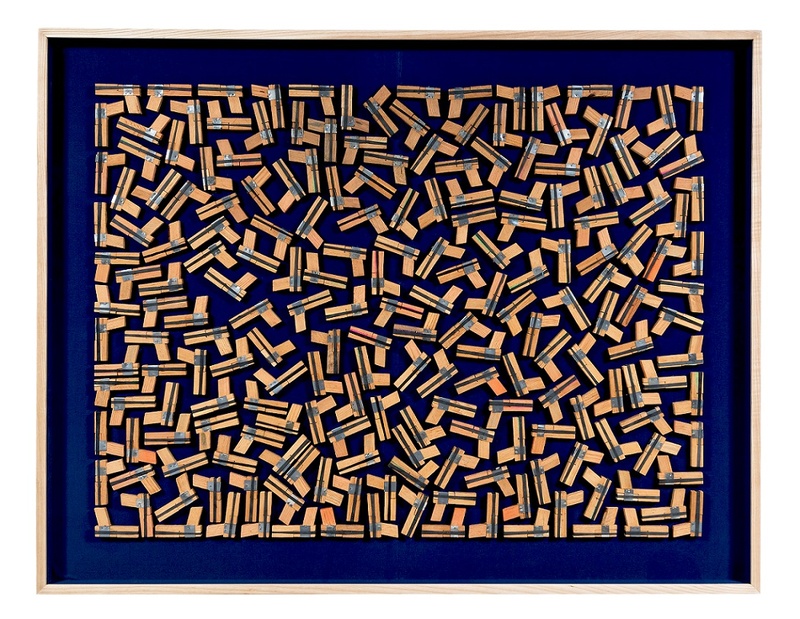 This piece, 14.23 (2014), is accompanied by three additional works from the series Everyday Museum, where the image is constructed according to a logic of progressive cancelation of empty space that is being filled with elements taken from the everyday, such as wooden rulers, toys, dusters or fibers used to wash. Thus, the organization of found material becomes the crucial part of a process that determines the final form: an abstract way of observing and commenting the mundane. 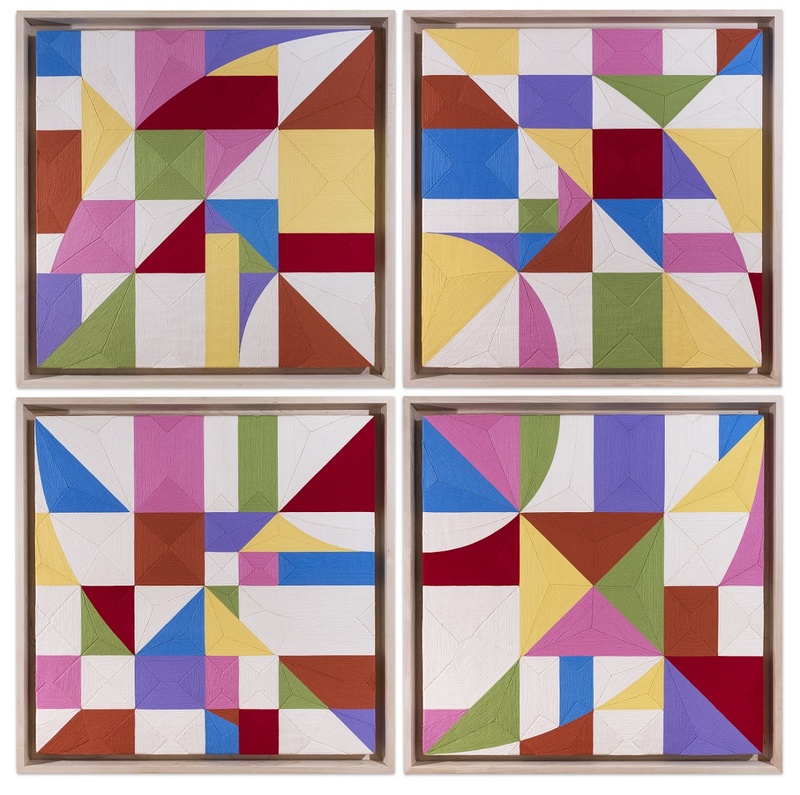 Something rather similar occurs with the body of work made with wool yarn on wooden board from the series Possibilities of a Structure, of which four are on view in this show. 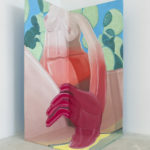 As the title might allude, these pieces of notable investigatory nature, present each a new possibility for a determined structure. 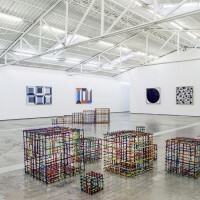 Possibilities of a Structure elaborates variations of geometric configurations, which Terrazas had outlined in the 1970s and that defined his artistic practice from the very beginning, essentially, as an ars combinatoria that seeks to exhaust the almost endless variations that can result from one basic figure. From the combination of elementary shapes, such as circles, squares, lines and curves, the artist creates a complex visual experience that emerges through the possible permutations of the system, which the artist calls game. 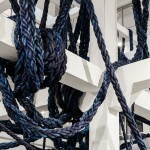 And this playful and almost scientific mechanism is tightly intertwined with the technique used to create those pieces. 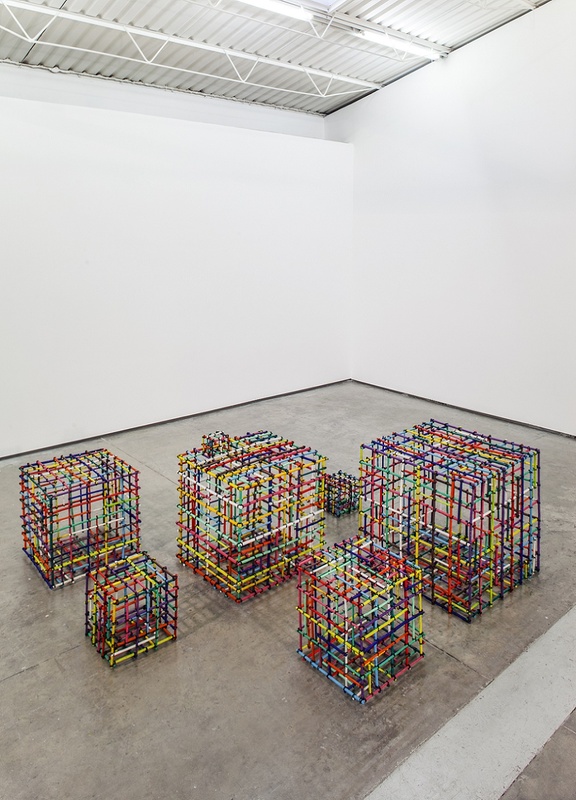 For Terrazas, the reconciliation that can be established with manual work, or better the notion of craft, with its paused temporality and its thoroughness, is essential part of his practice as a visual artist. And it is precisely this artisanal character that distinguishes these objects —elaborated following the ancient Huichol weaving technique— in which its patterns are developed slowly by placing thread by thread on a Campeche wax covered surface. From the distance these tableaus can appear to be oil paintings, yet as we get closer, the lines from the weaves betray the uniformity and reveal a wavy and changing topography. The furry texture, the intense and vivid colors of the yarn contrast completely with the common concept of an art that is governed by a geometric principle, which also contributes to the sensation that what we see is a mandala. And, indeed, they somewhat resemble Buddhist circles, for they are representations where the cosmos appears in the shape of a circle inscribed inside a square formation. 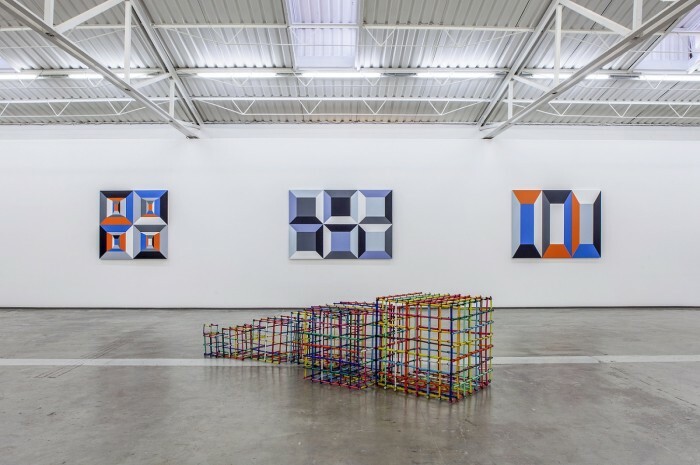 The set of works presented in this exhibition allow the spectator to observe the different variations based on one and the same scheme. 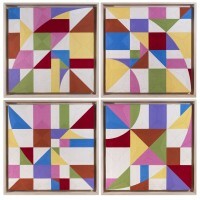 From one permutation to another the trace of the basic drawing remains visible, yet the configuration and order of certain elements shifts, and so does the use of colors, at times radically, to the point where they would appear to derive from different patterns. However, the transformation not only takes place within the overall appearance, but also inside each given structure: there are infinite mutations that emerge, even given a monochromatic color range. 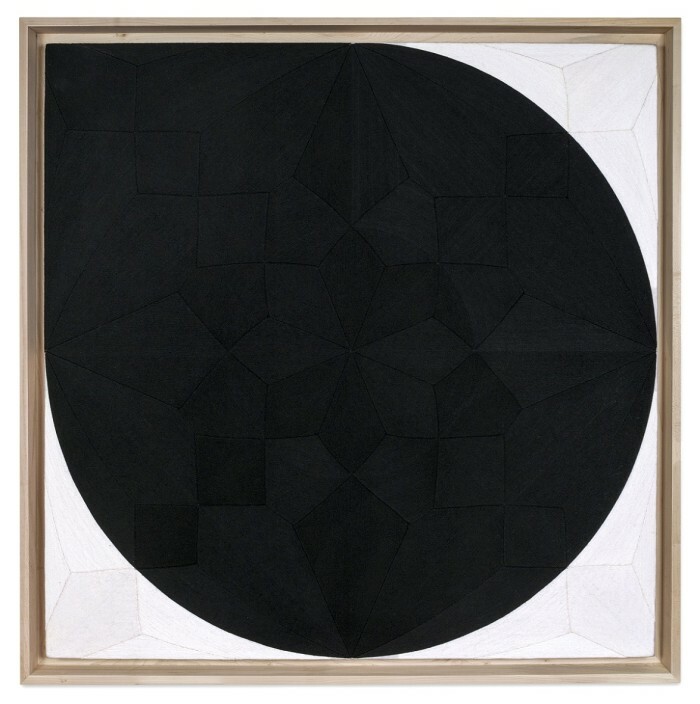 And this is not necessarily the result of Terrazas’ occasional use of different tones of one color, grey for instance, but rather of the thread’s texture that reflects the light in different shades, thus progressing from dark to bright. 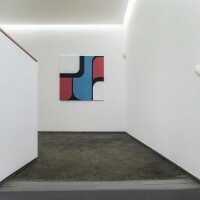 This, in the artist’s words, «generates an interesting quality, as the texture affects the general configuration of the image, which therefore appears in different shades while actually being the same red or blue.» This transforms the pieces into fields of an extremely changing nature, and it’s precisely this effect that provokes a rather long-lasting process of contemplation. 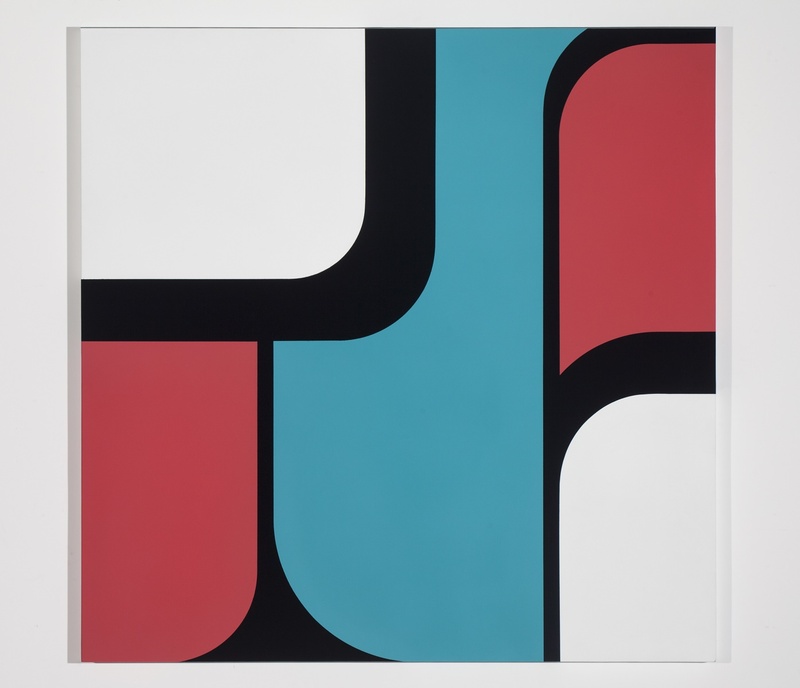 The series of acrylic paintings entitled Windows derive from a series of drawings that Terrazas executed in 1982, where he not only sketched their patterns and shapes but also the colors which thirty years later would be materialized. 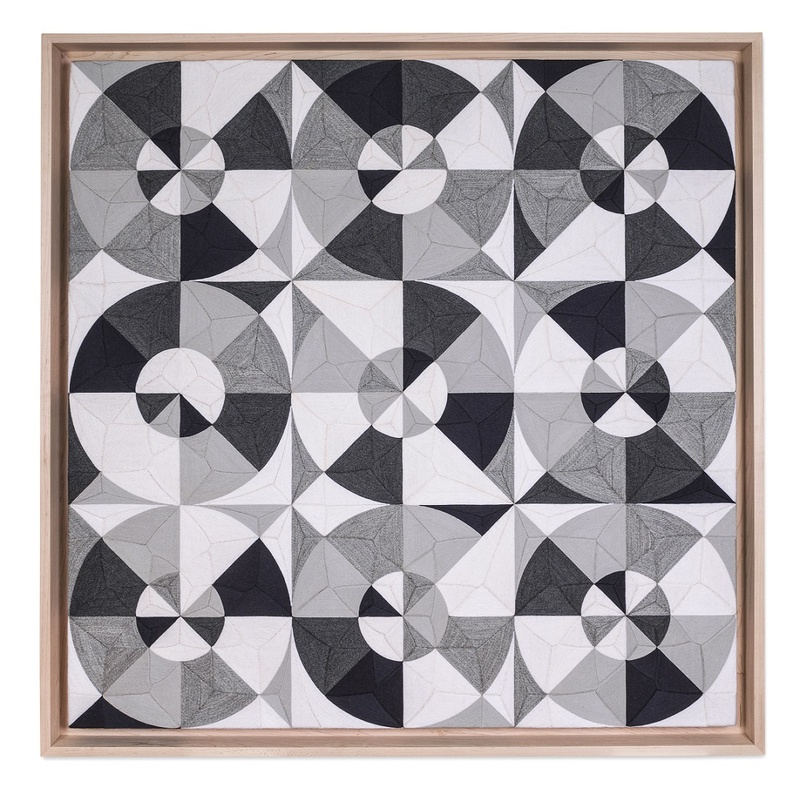 These images, which have a far more graphic and slick finish than the wool yarns, give the illusion of depth and delve into an isometric reflection, which offers the exploration of different possibilities of one and the same geometric idea: perspective. 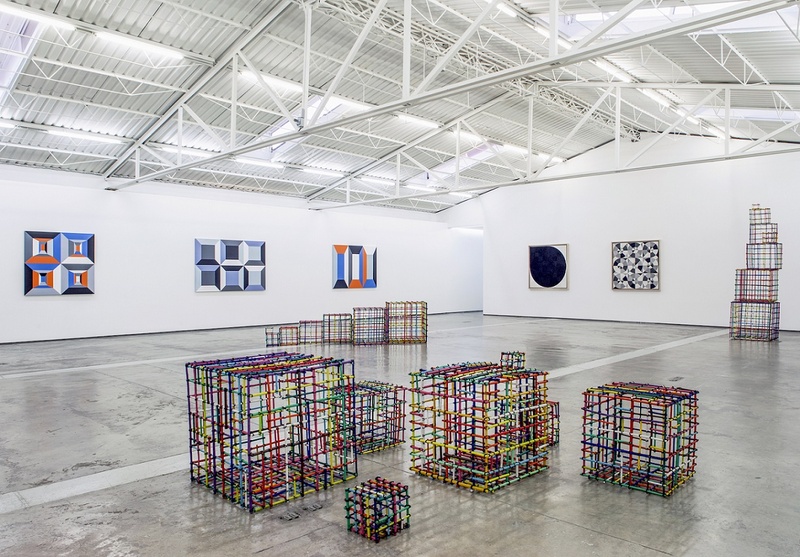 There are two further bodies of work that complement the rather known plastic meditations by Terrazas in this exhibition. 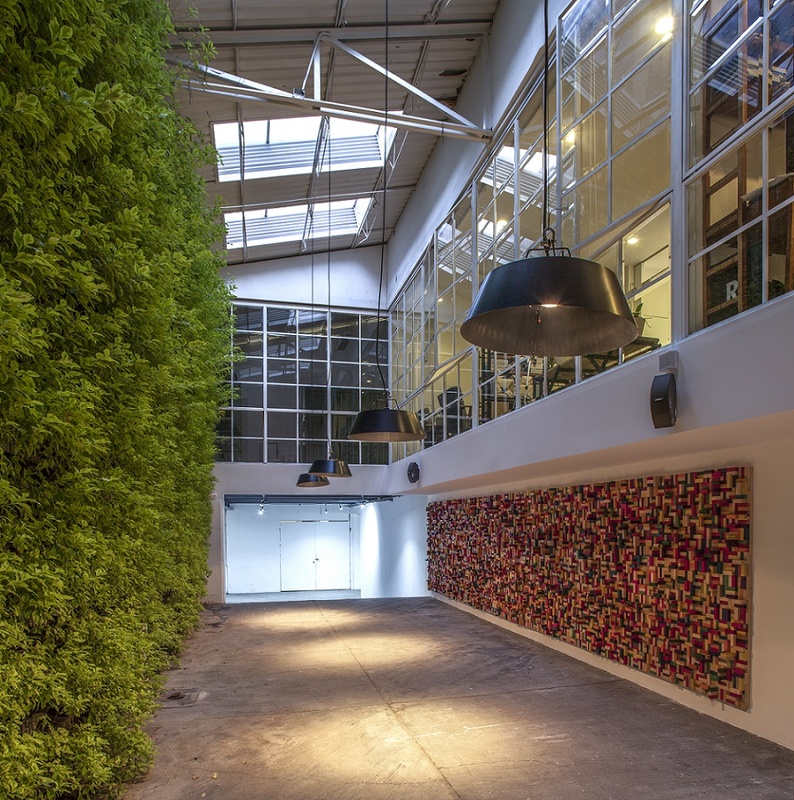 The first one, Cubes, comprises sculptural compositions combining a series of cross-linked cubic trusses made from tree branches inked with lively colors. Here, once again reappears the spirit of repetition: a scheme is developed, following a predetermined idea. 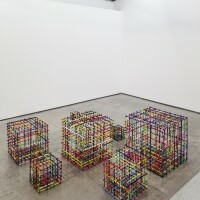 Here, the basic configuration and the common denominator amongst the pieces is the cube, from which different structures are created, based on the grid that is produced when following a progressive growth principle. 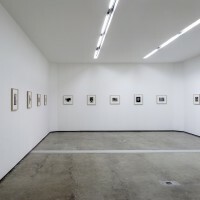 And although it would seem that the sequence of photographs on view at the back room derive from an entirely different investigation, as they appear to have no relation to geometry, yet, in fact, they embrace the same serial spirit that dominates the rest of his work. These are a series of photographs that Eduardo Terrazas took in the 1970s while on strolls through downtown Mexico City, capturing the variety of curious shop window compositions. Be it underwear, mirrors, silverware, laces, or rasps, the salesmen staged arrangements that resemble the ones Terrazas created in Everyday Museum, where the repetition of a one and the same element is the constant. 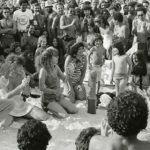 These photographs have not been shown to the public in a long time, making this an unsurpassable opportunity to approach another facet of Terrazas’ artistic investigation, where the changing nature of objects occupies the center of his aesthetic concerns. 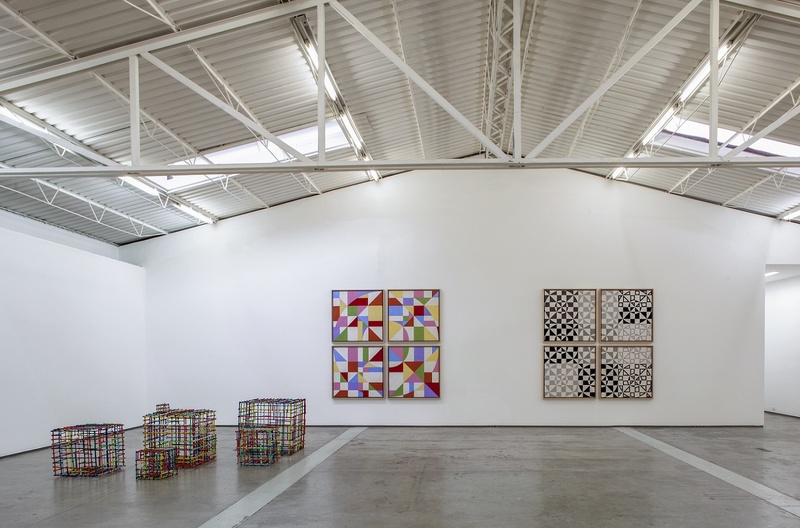 Más que una pequeña retrospectiva, esta nueva exposición de Eduardo Terrazas se ofrece como una tentativa de abarcar el amplio registro de técnicas y medios en los que ha incursionado el artista desde sus inicios. 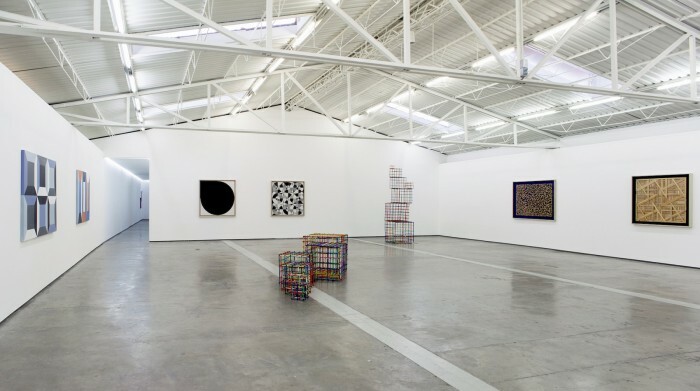 Aunque, desde luego, también puede ser vista como una muestra que busca recapitular la larga trayectoria de Terrazas como artista visual, ya que la obra más temprana en esta exposición se remonta a 1970. O por lo menos, de ese año viene el dibujo en el que está basado la pintura que aquí vemos. Un esquema de colores contrastantes que recibe al espectador al final de la escalera y que recuerda las disquisiciones que tenían lugar, en ese tiempo, sobre la interacción de las líneas y el color. También de los años setenta proceden las fotografías que pueden verse en el cuarto del fondo. Esto significa que además de la variedad de procedimientos, aquí están reunidos más de cuarenta años de disertaciones plásticas. 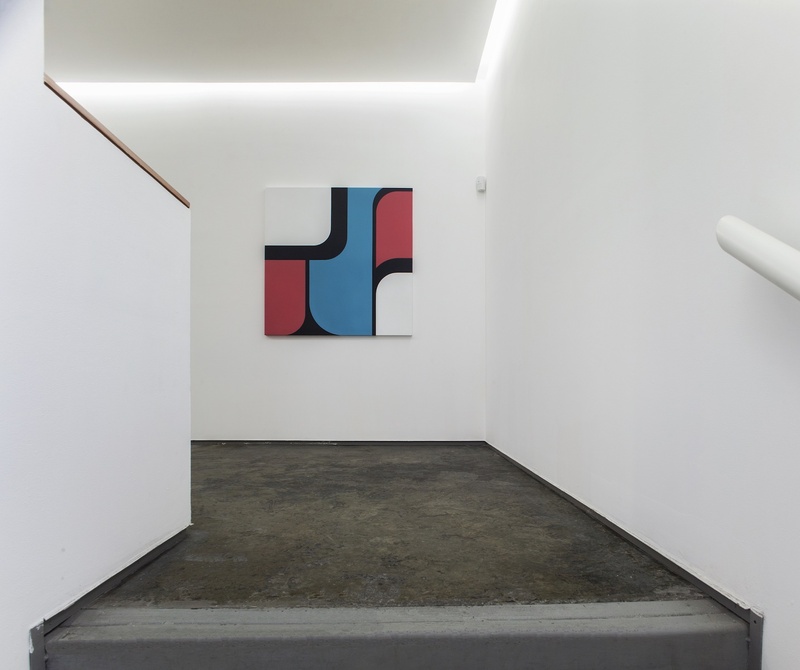 Desde los años sesenta, Eduardo Terrazas ha acompañado su práctica arquitectónica con una reflexión bidimensional, que corre paralela al diseño y levantamiento de edificios, pero que, sin duda, se alimenta del entendimiento que el artista tiene de lo que implica trabajar con volúmenes y estructuras físicas, y no únicamente con suposiciones teóricas sobre el papel. De ahí que mucho de su trabajo como artista –que, en efecto, tiene como punto de partida las hojas del cuaderno–, tenga un aire abiertamente constructivista, y que en ocasiones pueda, incluso, salirse del plano y ocupar con comodidad el espacio, como puede observarse en el gran mural de la planta baja, hecho enteramente de bloques entintados con anilina, de los que se usan en algunos juegos de mesa, como el Jenga. Esta obra, 14.23, del 2014, viene acompañada de otras tres piezas recientes de la serie Museo de lo cotidiano, en las que la imagen se construye según una lógica de cancelación progresiva del espacio en blanco, que va siendo llenado con elementos tomados de la vida diaria, como reglas de madera, juguetes, metates, plumeros o fibras para lavar (en la galería pueden verse solamente los realizados con reglas y pistolas de madera). La organización de los materiales se vuelve así el centro de un proceso que en sí mismo, determina la forma final. Una manera abstracta de mirar lo cotidiano. Lo mismo ocurre con las piezas realizadas con hebra de lana sobre bastidor de madera, de las cuales aquí se presentan cinco, pertenecientes a la serie Posibilidades de una estructura. Como su nombre lo indica, estas piezas, de naturaleza claramente investigativa, ofrecen, cada una, una nueva posibilidad de una determinada estructura; es decir, son variantes de los componentes básicos de dichas configuraciones geométricas, muchas de las cuales Terrazas esbozó en los años setenta, y que desde el comienzo definieron su trabajo, esencialmente, como un ars combinatoria que busca agotar las variaciones que pueden hacerse de una estructura dada. A partir de formas elementales –como círculos, cuadrados, líneas y curvas, con potencial infinito de combinación– el artista crea una experiencia visual a la que el espectador difícilmente puede sustraerse, ya que el aspecto de la obra depende del funcionamiento del sistema, lo que el artista llama juego. Y ese funcionamiento va, además, estrechamente de la mano de la técnica, en extremo peculiar, con la que se llevan a cabo estas piezas. Para Terrazas, la reconciliación que puede establecerse con el trabajo manual, con su temporalidad pausada, su minuciosidad, es parte esencial de su labor como artista visual. Y es justo el carácter artesanal lo que singulariza a estos objetos, producidos según la antigua técnica de las tablas huicholas, en las que los patrones se construyen lentamente, al ir colocando hebra por hebra de lana teñida sobre una superficie cubierta de cera de Campeche. A la distancia pueden parecer óleos, pero de cerca las líneas del tejido traicionan la uniformidad y nos devuelven una topografía accidentada y cambiante. La apariencia afelpada y los colores alegres y vistosos de los estambres contrastan por completo con la idea que suele tenerse del arte regido por un principio ordenador geométrico; lo cual contribuye a crear la sensación de que podría tratarse también de mandalas. Y es que, en efecto, algo tienen de los círculos encantados del budismo, pues son representaciones donde el cosmos aparece en forma de círculo inscrito dentro de una forma cuadrangular. Los conjuntos de obra, como el que aquí se presenta, permiten observar al espectador cómo se suceden las variaciones de un mismo diagrama. De una permutación a otra el trazo del dibujo original permanece, como puede verse en las piezas de la subserie Nueve círculos o Cosmos, pero la disposición u orden en que estaban ciertos elementos cambia, así como el uso de los colores, a veces radicalmente, al punto de que parecerían estar hechas a partir de patrones distintos. Pero no es sólo que la apariencia de las obras se transforme de una a otra, sino que dentro de cada estructura se producen interminables mutaciones, incluso de un mismo color. No únicamente porque el artista elija, en ocasiones, trabajar con distintos matices, por ejemplo, de gris, sino porque el estambre, al ser colocado sobre la superficie, pasa dramáticamente del oscuro al claro, según las condiciones de luz. Lo cual, observa el artista, les da «una calidad interesante porque la textura afecta la configuración general de la imagen, que se ve de diferentes tonos aunque sea del mismo rojo o azul.» Esto convierte a las piezas en campos de naturaleza extremadamente cambiante, efecto que sin duda prolonga el encuentro del espectador con ellas, ya que las variantes de tono y densidad, por mínimas que sean, merecen ser contempladas con detenimiento. Los acrílicos, que llevan por nombre Ventanas, provienen de una serie de dibujos que el artista realizó en 1982 en uno de sus cuadernos, donde quedaron bosquejados, no sólo los patrones, sino también los colores que se usarían treinta años después. Estas imágenes, que tienen un acabado mucho más gráfico, por su naturaleza lisa, que las hebras de lana, dan la ilusión de profundidad y se adentran, así, en una reflexión isométrica, a partir de la cual se exploran distintas posibilidades de presentación de una misma idea geométrica: la de la perspectiva. 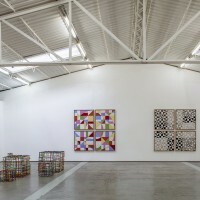 Dos cuerpos de obra se añaden en esta exposición a las meditaciones plásticas más conocidas de Terrazas. El primero, Cubos, en el que ha venido trabajando el artista desde hace meses, está conformado por composiciones escultóricas, a partir de combinar una serie de armazones cúbicos reticulados, hechos con varas de árboles entintadas en colores vivos. De nuevo, reaparece el espíritu de la repetición, ya que aquí también hay un desarrollo de un esquema que parte, como en las obras de hebra de lana, de una idea predeterminada. Sólo que en este caso la configuración básica, y el común denominador entre todas las piezas, es el cubo, a partir del cual se crean las distintas estructuras, basadas en una cuadrícula que se produce siguiendo un principio de de crecimiento progresivo. 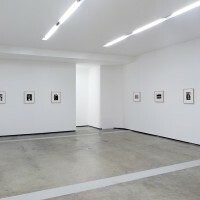 Y aunque pueda parecer que las fotografías que se muestran al final de la exposición provienen de una reflexión por entero distinta, ya que aparentemente nada tienen que ver con geometría, en realidad, en ellas está presente el mismo ánimo serial que domina el resto de los trabajos. Se trata de un conjunto de imágenes que Eduardo Terrazas tomó en los años setenta, en sucesivos paseos por el centro de la Ciudad de México, en los cuales se dedicó a capturar las curiosas composiciones de las vitrinas de los distintos comercios. Sin importar que fuera ropa interior, espejos, cubiertos, cordones, manos de muñecos o limas, los vendedores se ocupaban de generar arreglos que recuerdan a los que el propio Terrazas realiza en Museo de lo cotidiano, donde la repetición de un mismo elemento es la constante. Estas fotografías no se han mostrado en décadas, así que esta es una ocasión inmejorable para acercarse a otra faceta del trabajo plástico de Terrazas, donde la naturaleza cambiante de los objetos ocupa el centro de sus preocupaciones estéticas.